Emmy nominee and TV Land Legend Award winner ELINOR DONAHUE has joined the cast of Harvey (buy tickets now) and we couldn’t be more thrilled. North Carolinians probably know her best as Andy’s girlfriend Ellie on The Andy Griffith Show–because the show still airs several times a day in NC. Elinor is truly a TV icon: she received an Emmy nomination as Betty on Father Knows Best and has been a series regular on The Odd Couple (as Miriam, Felix’s girlfriend), Dr. Quinn Medicine Woman (as Rebecca, Dr. Quinn’s sister) and she even played Chris Elliot’s mom on the cult hit Get a Life. Her work in Guest Star roles encompasses so many beloved shows and genres we can’t list them all…but here are a few: Star Trek, The Golden Girls, Friends, Cold Case, Murder She Wrote, Ellen, Mork & Mindy, Coach, The Dukes of Hazzard, Happy Days, Diff’rent Strokes, The Flying Nun, Newhart, Days of Our Lives, Santa Barbara, The Young and the Restless, Dennis the Menace, The Love Boat, Fantasy Island, Hotel, One Day at a Time, 77 Sunset Strip, Have Gun-Will Travel, Dr. Kildare, S.W.A.T, Police Woman, Barnaby Jones, The Rookies, The Virginian, The George Burns and Gracie Allen Show, and The Loretta Young Show. On the big screen, her recent work includes Princess Diaries 2 with Anne Hathaway and Julie Andrews, Pretty Woman with Julia Roberts, and Freddy’s Dead: The Final Nightmare. By the time she was five, she was placed under contract to Universal Studios and completed her first film, Mr. Big with Donald O’Connor. At age nine, she moved to MGM, and during that studio’s heyday she appeared in The Unfinished Dance and Tenth Avenue Angel with Margaret O’Brien; Three Darling Daughters with Jeanette MacDonald and Jane Powell; and Love is Better Than Ever with Elizabeth Taylor. At other studios, she had roles in Tea for Two with Doris Day and Gordon MacRae; My Blue Heaven with Betty Grable; and Girls Town with Mamie Van Doren and Mel Torme. Elinor has also graced the stage in many theatrical productions including Critic’s Choice, Murder Among Friends, Tribute, Alone Together, and Never Too Late. 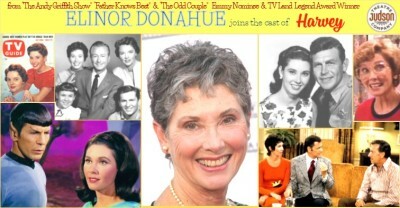 Judson Theatre Company is so very honored to have this TV Land Legend Award winner coming to Pinehurst–and remember, you can’t see Elinor Donahue in Harvey anyplace else.